The Dow Jones index continues to conquer new heights: the rate is trading near its historical maximum of 25394.5. Only from the beginning of the New Year, the asset added to its value of about 1.5%, which is a kind of record, considering low, as a rule, trading volumes at the beginning of the year. On the other hand, the period of publication of corporate reports on corporate profits will soon begin, and many analysts expect the growth of this indicator, which is a good signal for the purchase of the asset. Fundamental indicators continue to testify to the growth of the economy: in particular, such an important indicator as employment in the non-agricultural sector added 148K last Friday. This is less than economists predicted (190K) but is still good. If employment continues to decline, it may be a signal for the Fed not to rush with raising rates, but the probability of this event in the current situation is extremely unlikely. 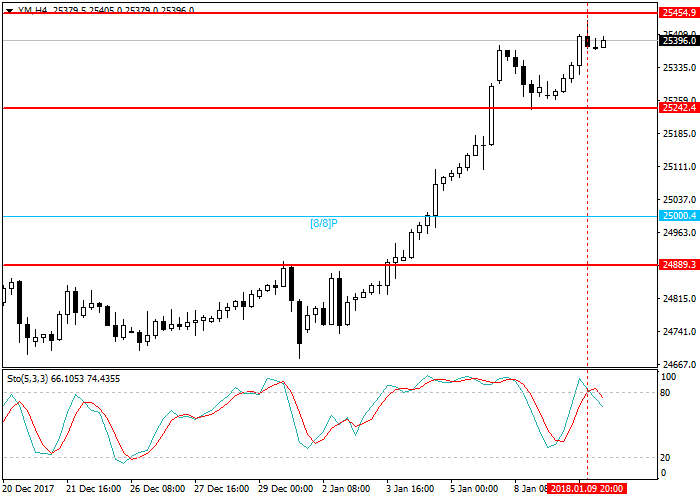 Stochastic is at the level of 81 points and indicates the possible correction. Long positions may be opened from the support level of 25242.4 with take-profit at 25500.0 and stop-loss at 25200.5.